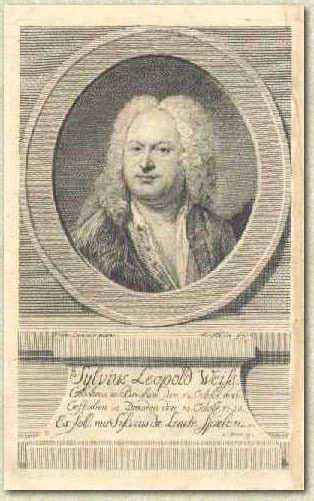 Silvius Leopold Weiss. Copper engraving  by Bartolomeo Folino [1730-after 1808] , after a painting (c. 1740), now lost, by Balthasar Denner [1685-1749]. This engraving was included in the first volume of Neuen Bibliothek der schönen Wissenschaften und freyen Künste, Leipzig 1765. The reasons for dating the original painting to c. 1740 is that it shows Weiss in his "mature" years and that Denner in 1740 also portrayed Johann Adolf Hasse, who was the leader of the court orchestra at Dresden. It is hardly likely that the engraving was made before 1750 as Weiss died that year and Folino was but 20 years old. Folino was born in Venice and died in Warsaw. He also engraved maps. More on this engraving can be found in my article A Poet's Description of the Lute Playing of Silvius Leopold Weiss, and a Possible Link Between Weiss and David Kellner.